30 MMS December 2017 mmsonline.com RAPID TRAVERSE Machining Technology in Brief fragments of material pull away from the workpieces and into the electrolyte, leaving a behind clean, smooth surface. Afterward, multiple rinsing steps remove any residual electrolyte before the parts are dried. With highly repeatable material removal controlled to within ±0.0002 inch, parts as thin as 0.004 inch can be deburred without the risk of nicks or other imperfections that could result from even the slightest physical contact. Although the non-mechanical nature of elec- tropolishing makes it well-suited for the most delicate high-volume deburring applications, it is also largely limited to those applications. The longer the electrical current is applied, the greater the amount of material removed, but the less uniform the results. Thus, the process is generally suitable only for micro burrs, or those that protrude less than about 0.0015 from the part surface. Parts with larger, macro burrs are better can- didates for processes like barrel tumbling and vibratory finishing. Unlike electropolishing, these processes leverage mechanical means to smooth surfaces and round sharp edges. In barrel tumbling, the material-removal mechanism consists largely of the workpieces themselves, which are placed in a spinning container along with an abrasive compound, which is carried in a medium that also helps cushion the parts. As a side benefit, the repeated impact associated with this process can strengthen some alloys. In vibratory finishing, the removal medium consists of specially shaped pellets that are placed with the parts in a bowl or tub that vibrates at high frequency. Compared to tumbling, this process tends to be both faster and gentler on the parts. It also offers the opportunity to deburr internal part features. However, both of these processes can leave behind material protrusions and surface imperfec- tions. In applications with stringent surface-finish requirements, electropolishing can thus become a complement to these generally more efficient processes as a secondary finishing step. Deter- mining the correct finishing process or series of finishing processes often requires experimenting with samples and smaller prototype lots prior to ramping into full production. Should electropolishing be a part of your finish- ing equation? Here are a few key points to consider: It targets more than just burrs. The amount of material to be removed—as expressed by size tolerances—is the primary consideration in deter- mining whether a part is a good candidate for electropolishing. Af ter all, as a true finishing process, electropolishing removes material evenly from all facets of a part. Although this facilitates surface finishes on the order of 4 to 32 Ra, it also means that somewhere between 0.0005 and 0.001 inch of material must be removed for the process to be effective. Given that burrs tend to narrow as they protrude further from the surface, the width of the burr base is a more important consideration than height. It requires more than just technology. Although resources are available for anyone to learn the basics of electropolishing, the process is of ten outsourced rather than conducted in house. A major reason for this is that producing the desired results is, in many ways, an art as well as a science. 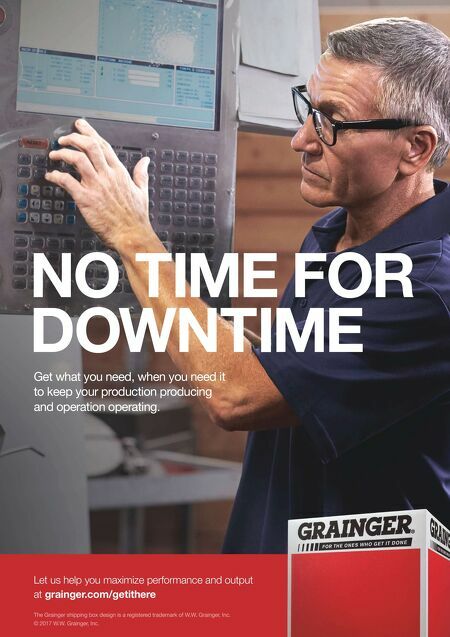 Jobs differ in terms of materials, surface-finish specifications and other require- ments. Processing parameters and the precise blend of electrolytes required differ accordingly. Workholding can be complex. Parameters and electroly te formulations are not the only aspects of this process that require significant expertise. Even a non-mechanical process requires some means of holding parts in place. That is because parts must uniformly carry current. As a result, the parts cannot just be "hung on a hook" like they could be for electroplating, a process that uses electric current to add, rather than remove, metal but is nonetheless compared frequently to electropolishing. Customized rack- ing dedicated to fragile parts can be both chal- lenging and time-consuming to configure. It works for more than just stainless. Along with the necessary expertise for all of the above, some electropolishing ser vice providers can process a wider variety of materials than many prospective customers believe. In addition to stainless steels, the process is suitable for brass, copper, carbon steels, nickel alloys, titanium, Nitinol and more—nearly any alloy, in fact. 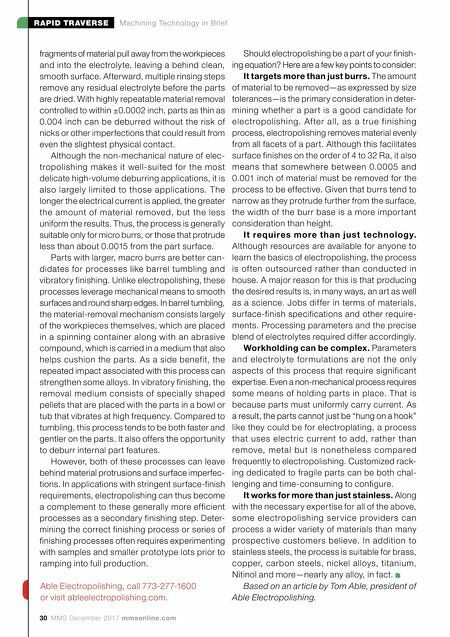 Based on an article by Tom Able, president of Able Electropolishing. Able Electropolishing, call 773-277-1600 or visit ableelectropolishing.com.